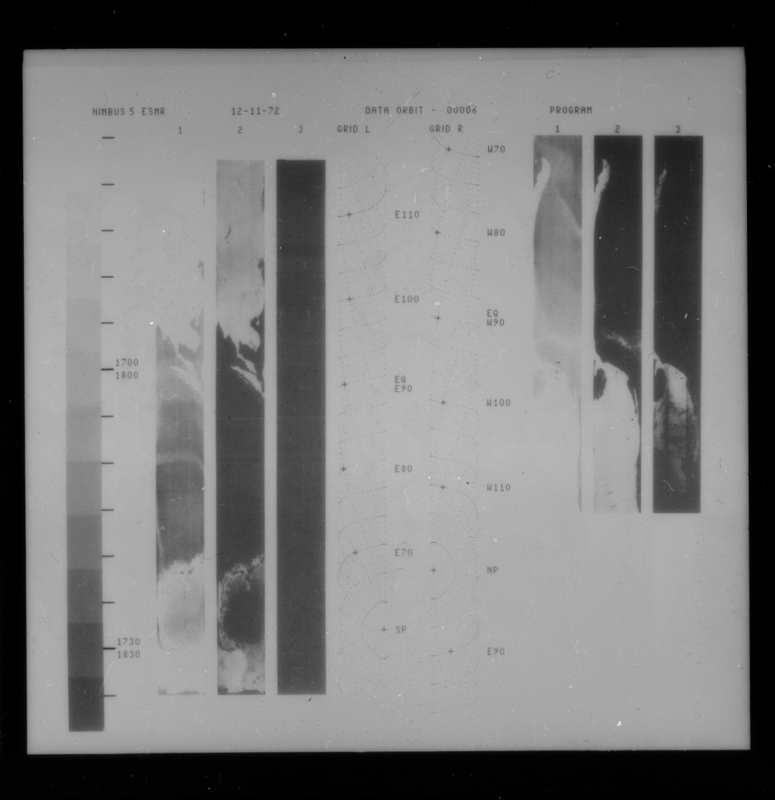 ESMRN5IM is the Nimbus-5 Electrically Scanning Microwave Radiometer (ESMR) data product containing daily brightness temperature images from 70-mm photofacsimile film strips. Each frame contains a geographic grid and two groups of three parallel strips of imagery, each containing one-half the orbital data. The spatial coverage is identical in each group, but each strip has a different dynamic range for its gray scale: 100-200 K, 190-270 K, and 250-300 K, respectively. The spatial resolution is 25 x 25 km near nadir, degrading to 160 km cross-track by 45 km down-track at the ends of the scan. The images are saved as JPEG 2000 digital files. About 2 weeks of images are archived into a TAR file. Additional information can be found in "The Nimbus 5 User's Guide." The primary objectives of the ESMR experiment were: (1) to derive the liquid water content of clouds from brightness temperatures over oceans, (2) to observe differences between sea ice and the open sea over the polar caps, and (3) to test the feasibility of inferring surface composition and soil moisture. To accomplish these objectives, the ESMR was capable of continuous global mapping of the 1.55-cm (19.36 GHz) microwave radiation emitted by the earth/atmosphere system, and could function even in the presence of cloud conditions that block conventional satellite infrared sensors. The ESMR instrument made measurements from Dec. 11, 1972 until May 16, 1977. This product was previously available from the NSSDC with the identifier ESAD-00192 (old ID 72-097A-04C). These images can be used to supplement the level-1 radiance data files from the ESMRN5L1 data product.